Here in the UK we have lots of Easter traditions and customs. 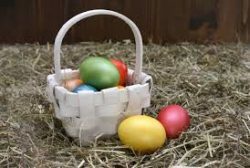 This includes the giving of chocolate Easter eggs and Easter egg hunts in which the children rush around to fill their baskets with as many eggs as they can find. 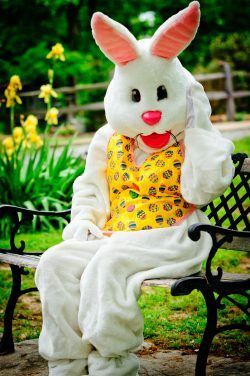 There is also the Easter Bunny who secretly leaves eggs for the children. Easter bonnets are another tradition these are hats that have been highly decorated in an Easter/Springtime theme. Kerala loves to celebrate a festival and Easter is no different. Easter Sunday will start with a special Easter breakfast of appams and chicken curry. The bells of the churches ring out all morning, and after attending the church service it is time to visit family where traditional Easter sweets and cake are shared out. Following this a festive lunch when meats, vegetables, rice breads, and desserts will be served. 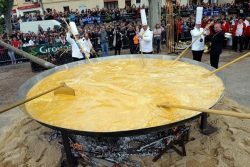 On Easter Monday, the residents of Haux crack more than 4,500 eggs into a gigantic pan to create a massive Easter omelette. Each family breaks the eggs in their homes and then gathers later in the main square where the eggs are cooked for lunch. The omelette will feed over one thousand people. Because of the amount of omelette produced it can take a few days for it all to be eaten! Egg fights are the tradition in Bulgaria and the winner is the last one with an unbroken egg is and assumed to be the most successful member of the family in the coming year, so a lot is at stake! 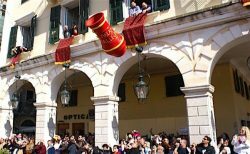 On the island of Corfu the tradition of Pot Throwing takes place on the Saturday morning. People throw large decorative clay pots from windows and roofs onto the street below the narrow streets are packed with locals and visitors to view the event. Children dress up as påskkärringar which translates to ” Easter witches” with painted faces. They carry a broom and go knocking on neighbours doors for treats, very similar to the Halloween traditions. The Swedish houses are decorated with twigs and the traditional smörgåsbord is eaten. 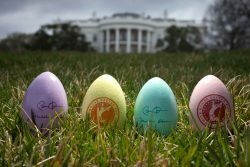 The President hosts the annual Easter Egg Roll on the White House lawn on Easter Monday. The tradition, believed to date back to the early 19th century, involves children rolling a coloured hard-boiled egg with a large serving spoon. Easter eggs for the children are hung from the branches of trees. 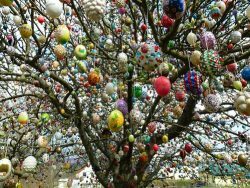 Streets will be lined with trees having thousands of multi coloured eggs hanging on them. This is a wonderfully colourful sight on Easter morning. Kite flying is how the Bermudians celebrate Easter, making their own kites with wooden sticks, colourful paper, and intricate designs. Across the Easter traditions are passed on through the generations, so whatever you do have fun and enjoy the Easter break.